There are many reasons to reboot an old film series but the worst one is, “We already own it and can make some money.” Not that the profit motive is bad, but it helps if you have a story to tell or there’s a huge public demand for the characters to come back. The audience for Teenage Mutant Ninja Turtles seems to consist of children watching the current cartoon on Nickelodeon and adults who recall the original comic books/cartoons/movies with nostalgia. The kids may enjoy this movie because kids enjoy most anything that’s not broccoli. Adults may be another story. For those of you coming in late, the title characters are about as contrived as you can get. You either accept them or you don’t. They were pet turtles mutated into human size talking creatures who are both teenagers and ninjas. We know they’re teenagers because they like pizza – a particular brand that is one of many shameless plugs in the movie – and they’re ninjas because they wear masks and call their leader sensei. Oh, and they’re all named for Italian Renaissance artists: Leonardo, Michelangelo, Donatello, Raphael. Now there’s nothing inherently wrong with a science fiction action movie that features unbelievable and cartoonish characters and relies a lot on CGI. Last week’s Guardians of the Galaxy is a perfect example of that sort of film being done exceptionally well. However, it helps to have actors interested enough in their roles to make them interesting, as well as a script that consists of more than fight scenes and lame one-liners. Unfortunately, the movie fails on both counts. "Kids may enjoy this movie because kids enjoy most anything that's not broccoli." When the film opens with Megan Fox as reporter April O’Neil you already know you’re in trouble. She’s doing fluff pieces but wants to break open the story of the Foot Clan which has been engaging in a series of criminal acts. Her cameraman (Will Arnett) and producer (Whoopi Goldberg) are skeptical, especially when she claims to have seen heroic turtle figures fighting them. The turtles (led by a giant rat voiced by Tony Shahloub) are fighting an evil plot by the seemingly indestructible Shredder, a big guy in a metallic version of a samurai outfit. The real villain, though, is Eric Sacks, friend and colleague of Amy’s late father. That’s not a spoiler. We know he’s a villain from his first onscreen appearance because he’s played by William Fichtner who’s at his best when he’s cast against type which, alas, is not the case here. At this point if you still care enough about the movie then only two things need to be said about it. For anyone who is beyond their pre-teen years, the movie isn’t very much fun. The action makes one appreciate the subtlety of the Transformers movies and the humor consists of things like one of the Turtles facing death admitting he didn’t get the ending of Lost, a TV show that ended four years ago. As for youngsters, the movie is properly rated PG-13. There is a lot of violence, and threats of violence, that may frighten very young or sensitive children. Parents know what’s appropriate for their own families, but it’s worth mentioning that this series was not originally intended to be kiddie fare. Showing the Turtles (well, three of them) chained up as the evil Sacks drains their blood for his nefarious scheme isn’t the sort of material most people would use to entertain six year olds. 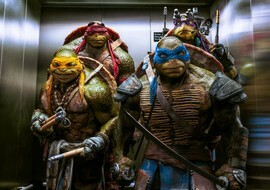 Teenage Mutant Ninja Turtles may succeed at the box office but, if so, it will only show that if a fan base is strong enough, one can make money with anything.